For each project manager, there’s their own favourite way to create the project management schedule. Some schedule tasks to resources directly, while others need to place the demands first and then see who's eligible and available for the jobs. In both custom and single project views there is a special section for unassigned tasks located on top of the chart. 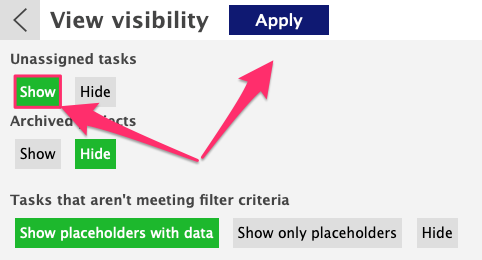 The visibility of the "Unassigned" section is optional. You can simply hide the information on the task bars, the tasks themselves, or the entire section. The settings can be edited at any time. On the top left there is a number that indicates how many unassigned tasks are in the pool within the visible time frame. On the contrary to the single project views, for custom views the "Unassigned" section is hidden by default. Click on 'Apply' once you're done. Make sure to save this from the View Settings (top left) to make this change permanent. Click on the arrow on the left to hide the info on the task bars. Schedule the tasks to the UNASSIGNED pool and later simply drag and drop them to an actual resource. 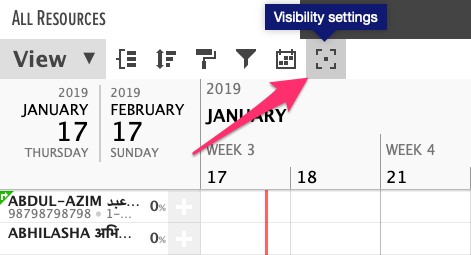 Or click on a task and then click on the V icon on the right of a resource you want to schedule the task to. The task is now moved from the UNASSIGNED pool to an actual resource.